Since X century, in Russia officially celebrate Easter and Russian orthodox easter holidays is loved by all Russians. Easter is considered one of the main holidays of Christians media. The word first appeared in Greece and if translated literally, means deliverance from anything. At Orthodox Easter, there is no particular day of celebration, every year is celebrated on different dates. The only thing you can guess the date of Easter is Sunday. Since ancient times, Easter celebrated and wildly fun, and many ancient traditions have been preserved until now. Before the festival, people bring home in order, and preparing for post. To worship all went Saturday evening. The service lasted all night and ended only in the morning. And the people exchanged eggs, kissed and said: "Christ is Risen!". At home the women had prepared a delicious meal and celebrated the feast. But before eating, of course, prayed and thanked God for giving them food. In those days happy Easter in Russian traditions was celebrated about 2 weeks. Have long preserved the traditions of dyeing Easter eggs with colorful paints. In Russia, when a man saw another, had to give him colour egg. No matter who you met: a simple peasant or rich, one must be sure to tell him: "Christ is Risen". In those holidays, would receive walk-in guests, make dances, in General, have fun. But the most favorite pastime of the people was to ring the bells. Anyone could climb up and ring the bells as much as his heart desires. Because of this, then all day he could hear the ringing from the bells. 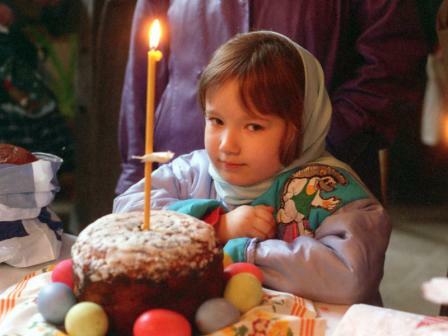 Many of the traditions of Orthodox Easter are still alive. Although, during the Soviet rule, the Passover was forbidden to celebrate. The service has been changed a little. Everyone who attended the service, fills a sense of lightness and joy. Of course, the only difference is that now not all cuddling with strangers. Unfortunately, people have become more shy. In Orthodox canons Easter is one of the key events in the Church calendar that is eagerly awaited by all, not just believers. In Russia, this celebration is a special traditions that people are happy to observe, in particular for a few days before the event, a large family gathers together for the holidays to decorate "eggs", this is a very exciting and entertaining process that allows you to be creative and spend time with loved ones. And also, if the hostess has an outstanding talent, in the oven "perform your miracle", preparing mud pies - cakes. It is believed that it is the coming of Orthodox Easter marks the arrival of spring, and mother nature wakes up after a "winter sleep". On this day, a miracle happened. Okres Jesus from the dead, has been revived thanks to come to his aid from heaven, an angel , and the good defeated the evil. It is Easter is the ancestor of all Church important dates. What are the ceremonial rituals that mark the "cross Sunday"? Firstly in this day among the faithful it is customary to rejoice , and to say a special greeting: Christ is risen! And in response, the man, to whom uttered the phrase, need to tell you the truth, varres! Secondly evening of Passover, you can spend a fun and unusual, using the tradition of caroling, as is customary during the Christmas holidays. Feel free to visit your friends to delight their games, nursery rhymes , and in return will receive generous treats and sweets. As in ancient times, if you have musical talent and skillfully play the violin, can show their talent and to please virtuoso playing guests. The symbol of the holiday – the egg symbolizes the origin of life, it is customary to decorate, giving a solemn look. And another fun game – ritual is an "Egg fight", two players take turns hitting the balls, the winner gets this healthy treat. In ancient times, it was believed that the egg has healing powers and affects the crops, saves the animals from the evils of diseases. "Easter feast"- the rich decoration of the table in this Church feast day is the key to the Blessing of the family for the whole period until next Easter. The main decoration are flowers, so welcome the beautiful spring. Delight guests on Easter decoration decorated eggs, cakes and Easter kulich. Also welcome meals from fruits and vegetables, the obligatory decoration of any food on this holiday will be the greens. "Holy Easter fire" In every home in the day light the fire, Easter candle, which gives the goodness and joy of the people, marking the arrival of this remarkable date for the Church world. Fire symbolizes light, goodness, positive energy. In light holiday of Christianity and the beginning of Spring decided to give each other cards, with the symbols of the celebration and wish all the best.